I should start by saying that it’s not necessary, of course, to know about your team’s history to be a “good” fan. I don’t even know what being a good fan really means (it means much different things to different people), anyway. 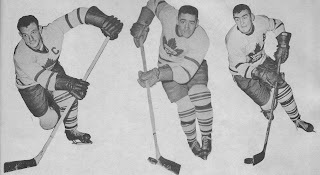 For me, though, it’s always been nice to have a perspective as a Leaf fan that dates back to (in my case) the late 1950s. I have a sense of the team’s heritage, even back well before my time, because I learned about the Leafs from my Dad, and also from reading a lot about the team as a youngster. I grew to know about the names like Pratt, Clancy, Conacher, Apps, Broda, Barilko and many others. (See the great old picture at right of 1950s Leaf captain Ted Kennedy with Sid Smith in the middle and Tod Sloan.) Though I never saw them play, in person or even on television, I was at least aware of their part in Maple Leaf lore. And it mattered to me. It helped make being a Leaf fan something a bit special, even when the team wasn’t very good in the current context of whatever time I was rooting for them. Of course, it wasn’t exactly difficult to be a Leaf supporter in the early-to-mid 1960s, my early life “hey-day” of being a Leaf fan. They were in the playoffs every year, and four times a champion. That wasn’t bad. Since then, as I’ve posted in the past, the Leafs haven’t always been lousy, but there have been some tough periods when the team was in no danger of challenging for a Cup. In fact, I would argue that that has been the case far more often than not. But I will also point to teams in 1971, 1978, 1993, 1994, 1999, 2002 and 2004 (that was the year they lost to the Flyers in that overtime game, right?) as teams that I felt had a legitimate shot at championship success, or at least making a run, as some of them did. All this said, my initial point is that knowing at least a bit about your team’s background is a good thing. Again, it doesn’t make you a better or worse fan, it just helps inform your views, in my mind. This is not to suggest that how a particular Leaf team did thirty years ago is in some way relevant to how the team plays nowadays. I realize it doesn’t. But from the perspective of a fan, it can provide some context, at least on occasion. Let’s look nearby at the city of Buffalo, a great sports town. If you’re a Buffalo Sabres fan, it’s good to know who Gilbert Perreault was, even if you’ve only been following the team for a few years. If you’re a Buffalo Bills fan, it’s neat to know that Jack Kemp, the long-time Congressman, was a star quarterback for the once mighty Bills in their early-to-mid 1960s American Football League days. Does it change anything if you don’t know those kinds of things? Absolutely not. But it sure helps when someone says “Danny Briere was the best Sabre ever….” to be able to at least be able to engage in a thoughtful discussion that perhaps there were players before Briere who brought something to the table, too. I could be very wrong but I’ve long had the sense that many Leaf fans, even many younger Leaf fans, have taken the time to check into the team’s past. If not, it's a great opportunity. There is a lot of amazing (and I think, important) history that, once it becomes part of our knowledge base, makes being a fan right now even more fun than ever before. Does Leaf history matter to you? It matters to me, very much indeed. Looking at the Leafs of the past brings joy to my heart and admiration, still, after all these years, for the men who wore the jersey. We seldom hear credit given to the wives, but they were women of great character too. Looking at history helps in terms of asking questions. What did they do differently back then? What can we learn from them? What can we take with us into the future? I do believe that the old creed of courage, loyalty and duty is a good team builder. As the players begin to get ready for this season, I pray that they see it as a dawn of a new era in Leaf history, and that the page they write will be their own. Thanks very much for your comment, Elizabeth. Some Leaf fans may not be aware that Elizabeth is a grandchild in the famous Smythe family that was such an integral part of building the Maple Leaf legacy. Her well-chosen words help to highlight more reasons why history is important, including in the context of a particular team in the sport world.